European foulbrood disease, a serious disease of honey bees in eastern Australia, has not been detected in Western Australia. The Department of Agriculture and Food, Western Australia has taken steps to prevent introduction of European foulbrood and developed plans to eradicate the disease should these preventive measures fail. For these plans to succeed, it is imperative that all beekeepers co-operate by reporting any brood disorder to the Department of Agriculture and Food immediately it is noticed. European foulbrood disease is caused by a bacterium Melissoccoccus pluton (formerly called Streptococcus pluton), which invades the mid-gut of four to five-day-old larvae and multiplies rapidly causing death. Unlike American foulbrood, chalkbrood and sacbrood diseases which affect the larvae in sealed brood cells, European foulbrood disease commonly affects larvae in open brood. Infected larvae move about inside the cell instead of staying in the normal curled position. Unlike American foulbrood disease, where the larvae consistently slump to the lower side of the cells, larvae infected with European foulbrood appear twisted in different positions. Infected larvae lose their pearly white sheen, turning creamy white through to yellowish brown and drying into loose brown scales. 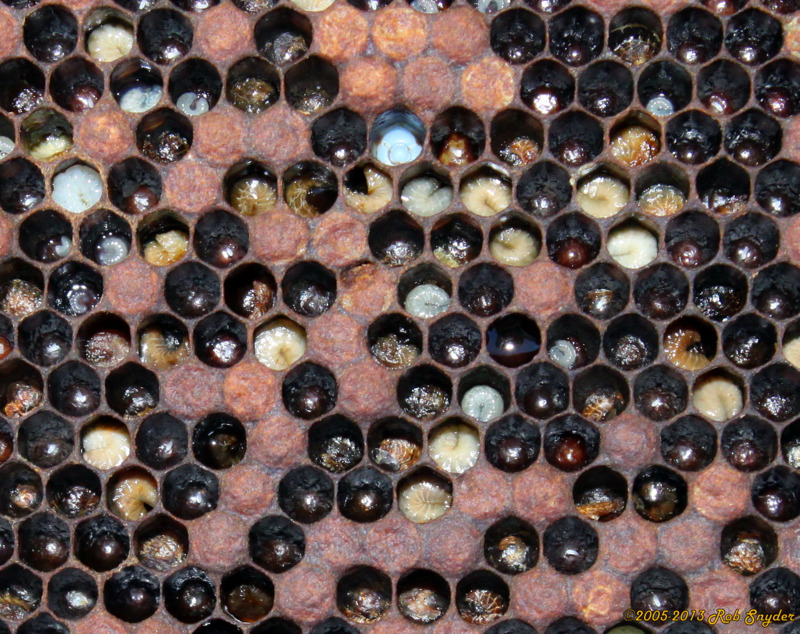 In severely affected colonies, the capped brood may appear irregular, similar to a failing queen or to American foulbrood disease. However, the brood cappings do not appear dark and sunken as with American foulbrood. The bacteria may not cause any odour in infected colonies. However, secondary invasion by other bacteria could result in a sour or foul smell. The secondary bacteria that flourish in dying larvae can cause variations in the classic signs of European foulbrood disease. Once the first signs appear, strong colonies can become non-productive within four weeks and the entire colony may die out if severely affected.